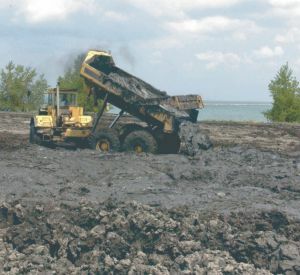 Once dredged, the sediment made the two-day trip up the Illinois River by barge to the Chicago Sanitary & Ship Canal to the Calumet Sag Channel to the Little Calumet River, past Lake Calumet to a slip near Lake Michigan at 87th Street in Chicago. There, it was excavated from the barge and trucked a short distance to the old steel mill site for spreading. When the sediment reached an appropriate consistency, the process of planting native grasses and other vegetation began. Within weeks of the planting, some rye grasses will appear. By spring 2005, the vegetation will be in full bloom on this once devastated industrial site. The Chicago Park District—which obtained the property from USX Corporation—will build a 17-acre park on the Peoria Lake mud. New housing construction will also occur nearby, and a gleaming new lakefront community will be created. Sporting enthusiasts, birdwatchers and boaters in both Peoria and Chicago benefit from the project. And migratory birds that use either the Illinois River flyway or the Lake Michigan shoreline will find slightly better protected habitats and food sources. "This project is the first of its kind in the nation," Mitchell said in May. "This is a huge recycling program that will save taxpayers money by using clean soil to create a beautiful new park." epartment of Commerce and Economic Opportunity, Illinois Environmental Protection Agency, Illinois Department of Agriculture, Illinois Environmental Protection Agency, Illinois Waste Management and Research Center, City of Chicago Department of Planning, City of Chicago Department of Environment, Chicago Park District, Fon du Lac Park District (East Peoria), Metropolitan Water Reclamation District, Artco Fleeting, Midwest Foundation, N.E. Finch Company, Caterpillar Inc., and Kress Corporation. "The model for this innovative project can be applied anywhere," LaHood says. 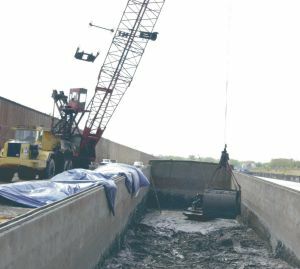 "Clean Illinois River sediment can be dredged from countless sites between Beardstown and LaSalle and used as topsoil for development or recreational purposes throughout Illinois." First appeared in May, 2004, on Chicago Park District and Illinois Lieutenant Governor's websites, then reprinted in Recreation Management magazine, Fall, 2004.